The GE Stacking Kit for Front-Load Washer and Dryer helps you maximize laundry space by stacking your dryer on top of the washer. It is appropriate for alcove or closet installation. Yes, this kit is compatible with your machines. how much height does this add to the stacked washer and dryer? Is this stacking kit compatible with DCVH680EJOMS &amp; WCVH6800JOMS? Yes, this stacking kit is compatible with DCVH680EJOMS &amp; WCVH6800JOMS. Stacking Kit for Front Load Washer and Dryer is rated 3.4 out of 5 by 22. Rated 5 out of 5 by Morgan from Simple must have for stacking. No issues noted.... Simple must have for stacking. No issues noted. 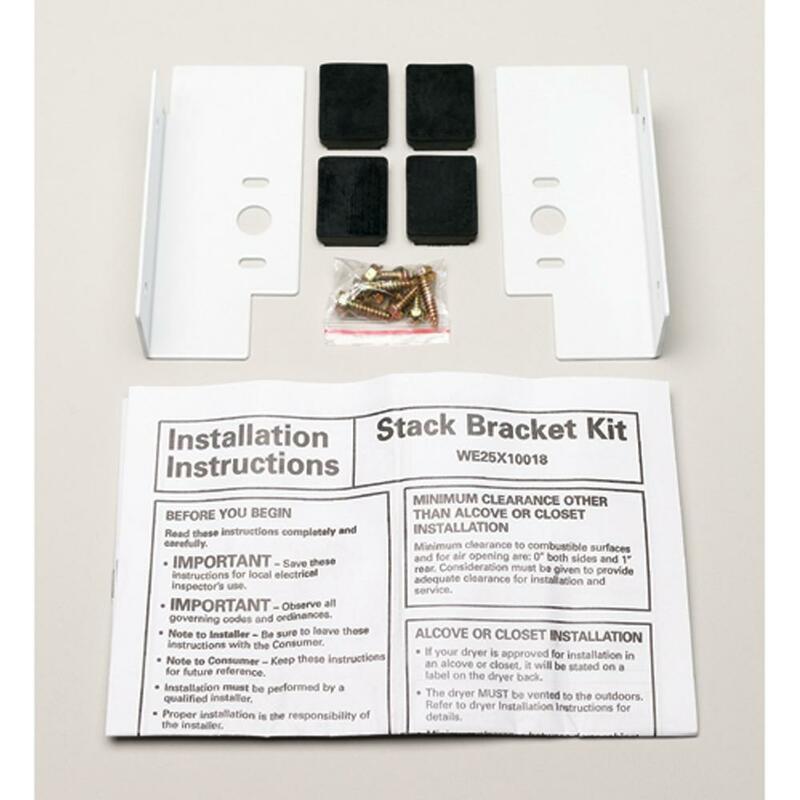 Rated 5 out of 5 by cljk from ease of installation and space saver This stacking kit has absolutely made our laundry room much more efficient as far as use of space. My husband and friend had no problem stacking our washer and dryer by themselves with this kit. Rated 4 out of 5 by missynstl from Pricey but perfect I would absolutely recommend this product based on the fact that it WORKED and accomplished getting my washer and dryer exactly as I wanted. That being said, it is insane how much it cost for nothing more than a couple of rubber wedges, a few screws and two metal plates. Rated 4 out of 5 by HomeDepotCustomer from The parts were great but the delivery charge of $59.00... The parts were great but the delivery charge of $59.00 was a rip off ! You had a service technician deliver the title box with the part and we were charged for a service call. Why not just ship it UPS for $10.00 ? A $49.00 part ended up costing $113.00. Rated 1 out of 5 by Ryan1986 from Again disappointed with GE. Read my review about converting the GFD45GSSMWW to LP. First of all... Again disappointed with GE. Read my review about converting the GFD45GSSMWW to LP. First of all, this is nearly $60 for less than $1 worth of parts. Second, the tape they used on the rubber pads is terrible, and just falls off. I ended up having to use a different 3M LSE tape, which worked MUCH better. Rated 5 out of 5 by Tara from Perfect for small spaces Absolutely love have my washer and dryer in the same place and for the money it was a great purchase! Rated 1 out of 5 by SuperDave from $50 for $3 worth of parts. This is the reason I avoid GE every chance I get. $50 for $3 worth of parts. This is the reason I avoid GE every chance I get. Rated 5 out of 5 by Words from Works great Easy to install. Works great. Washer and dryer are sturdy while stacked.